Research suggests that, when it comes to early childhood education and care, quality matters most. A growing number of countries are establishing monitoring systems to ensure quality and accountability in these programmes. This new publication explores how countries can develop and use these systems to enhance service and staff quality for the benefit of child development. It offers an international perspective and concrete examples to help policy makers, monitoring experts and practitioners in the field develop their own monitoring policies and practices. 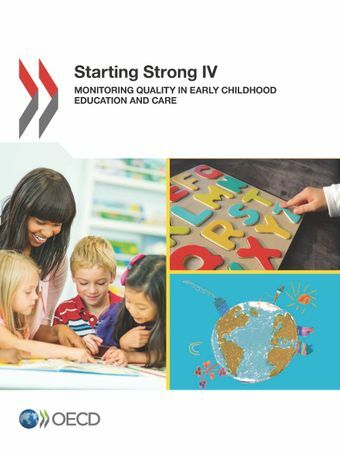 Launch of Starting Strong IV: Monitoring Quality in Early Childhood Education and Care at the International Policy Event on Monitoring Quality in Early Childhood Education and Care, held on 28 October 2015 in Dublin, Ireland, with Dr. James Reilly,T.D. Minister for Children and Youth Affairs of Ireland, and Montserrat Gomendio, Deputy Director for Education and Skills, OECD.